Have you learned about nutrition in school? If so, what was your favorite nutrition lesson? Do you have a favorite healthy recipe? Here are some fun recipes you may have made in your classroom. You Have the Power! Choose to eat healthy. Fruits and Vegetables make you strong! Read a letter from a 5th Grade nutrition student! 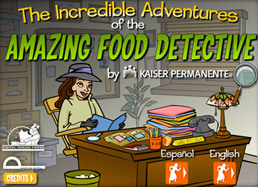 You can be a health hero at home! Find a healthy recipe and ask to make the recipe for your family. Try some of ours! Help out in the kitchen. 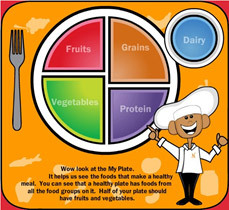 If you have had nutrition lessons in your classroom try using some of the skills you learned. You can help wash fruits and vegetables. You can help cut foods with a plastic knife or butter knife. You can help pick out some healthy recipes to try with your family. You can measure, pour and stir ingredients. You can turn off the TV or computer and be active. You can kick a soccer ball, throw a Frisbee, run around with your friends or family. You can ask your family to take a walk with you, or ride bikes, or go to the park. Have a contest with your family to see who can be active for the most minutes after school. Try being a Hero at school too! Eat breakfast; it fuels your brain. Choose and eat fruits and vegetables in the cafeteria. If you pack your own lunch ask your family to include fruits and vegetables every day. Play hard at recess. Remember to be active and keep moving: walking, running, jumping, and playing! Check out these fun websites. They will help you learn more about being healthy. Click the pictures to play the games! “Keep your bones strong, calcium can’t be wrong!